Manchu Manoj is acculturated to experiment on quirky scripts. 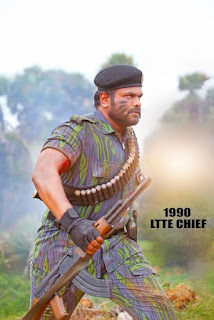 He took up the challenging role of former LTTE militant chief Velupillai Prabhakaran in this the new movie titled Okkadu Migiladu directed by Ajay Andrews Nuthakki and produced by SN Reddy, Laxmikanth. Okkadu Migiladu entered into last shooting schedule kick started from today morning at Aluminum factory. This schedule will be commenced till the month end shooting the crucial scenes wherein complete casting team will be present. “Okkadu Migiladu is a movie scripted on true incidents of 1990 during Sri Lankan Civil war leaving 15 Lakh civilians as refugees. We are confident that this film will be best in Manchu Manoj career and extremely happy with audience reactions to Manchu Manoj first look as Velupillai Prabhakaran released before. After doing Sri Lanka war backdrop powerful Prabhakaran character in the first schedule, director is presently shooting 2017 contemporary college scenes on Manoj. For the student character, Manoj lost 12 Kgs weight giving an authentic look to differentiate him from Prabhakaran. Okkadu Migiladu last schedule shooting is commenced from today at Aluminum factory. Director Ajay Andrews Nuthakki will helm this schedule till the month end shooting important scenes involving all the lead artists. This finishes the complete production and post production is progressing in parallel,” producers informed.